The Kamry k101 atomizer is a cartomizer that delivers a big kick in a small way. Don't let it's smallness fool you, you'll get lots of vapor and plenty of flavor. Just drip eight to ten drops of your favorite e-liquid into your cartomizer, avoiding the center hole, and attach a drip tip. 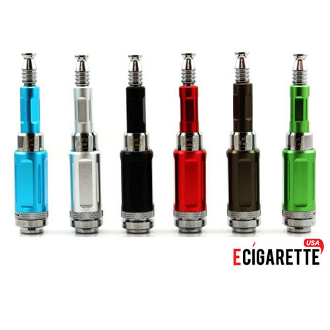 For added customization, add a K101 atomizer cover, they come in a myriad of colors to match your K101 MOD. NOTE: Screw the button clockwise (to the right) to unlock. Screw the button counter clockwise to the left to lock. *When finished, turn the ON/OFF locking ring to the right to lock it. This ensures the MOD will not fire up by itself if the button is accidentally pressed. Stop using a battery if it looks like its worn, the outer wrapping is torn, or if it's acting differently than usual.